An arteriogram is an imaging test that uses x-rays and a special dye to see inside the arteries. It can be used to view arteries in the heart, brain, kidney, and other parts of the body. The test is done in a medical facility designed to perform this test. You will lie on an x-ray table. Local anesthetic is used to numb the area where the dye is injected. Most of the time, an artery in the groin will be used. In some cases, an artery in your wrist may be used. Next, a flexible tube called a catheter (which is the width of the tip of a pen) is inserted into the groin and moved through the artery until it reaches the intended area of the body. The exact procedure depends on the part of the body being examined. You will not feel the catheter inside of you. You may ask for a calming medicine (sedative) if you are anxious about the test. 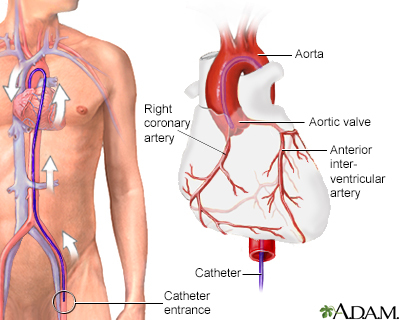 A dye (contrast) is injected into an artery. X-rays are taken to see how the dye flows through your bloodstream. How you should prepare depends on the part of the body being examined. Your health care provider may tell you to stop taking certain drugs that could affect the test, or blood thinning medicines. In most cases, you may not be able to eat or drink anything for a few hours before the test. You may have some discomfort from a needle stick. You may feel symptoms such as flushing in the face or other parts of the body. The exact symptoms will depend on the part of the body being examined. If you had an injection in your groin area, you will most often be asked to lie flat on your back for a few hours after the test. This is to help avoid bleeding. Lying flat may be uncomfortable for some people. An arteriogram is done to see how blood moves through the arteries. It is also used to check for blocked or damaged arteries. It can be used to visualize tumors or find a source of bleeding. Usually, an arteriogram is performed at the same time as a treatment. If no treatment is planned, in many areas of the body it has been replaced with CT arteriography. Chaer RA, Schneider PA. Carotid artery: dissection and fibromuscular dysplasia. In: Cronenwett JL, Johnston KW, eds. Rutherford's Vascular Surgery. 8th ed. Philadelphia, PA: Elsevier Saunders; 2014:chap 102. Goldstein LB. Approach to cerebrovascular diseases. In: Goldman L, Schafer AI, eds. Goldman-Cecil Medicine. 25th ed. Philadelphia, PA: Elsevier Saunders; 2016:chap 406. Mclafferty RB. Arteriography. In: Cronenwett JL, Johnston KW, eds. Rutherford's Vascular Surgery. 8th ed. Philadelphia, PA: Elsevier Saunders; 2014:chap 19. Velez-Montoya R, Olson JL, Mandava N. Fluorescein angiography and indocyanine green angiography. In: Yanoff M, Duker JS, eds. Ophthalmology. 4th ed. Philadelphia, PA: Elsevier Saunders; 2014:chap 6.6. White CJ. Atherosclerotic peripheral arterial disease. In: Goldman L, Schafer AI, eds. Goldman-Cecil Medicine. 25th ed. Philadelphia, PA: Elsevier Saunders; 2016:chap 79. An arteriorgram is the injection of contrast material or dye into one or more arteries to make them visible on an x-ray. The blood flow through the area can be evaluated with fluoroscopy (i.e., continuous X-rays that allow one to see the contrast material in movement).